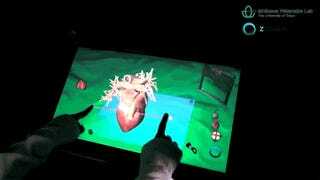 Working alongside a company called zSpace, makers of interactive holographic displays, researchers at the Ishikawa Watanabe Laboratory in Japan have built a high-speed gesture recognition system that instantly responds to hand and finger movements. Which in turn enhances the immersiveness of these interactive displays. Practicality still remains an issue, given the system relies on a pair of 500 fps high-speed cameras hanging overhead. So getting this technology into a consumer-friendly format is still going to take some time. But the researchers have added some unique functionality that might eventually trickle down to the tablets we've all come to rely on. In addition to using hands to manipulate a 3D object, a stylus can be added into the mix to control a camera for a different perspective. And the combination of on-screen and off-screen interactivity could allow more than one user to interact with a device at a time. It may not quite be Tony Stark's lab, but it's the kind of tech that's going to get us there—and sooner than you might think.